When you were little and your teacher asked what you wanted to be when you grew up, you surely didn’t answer “miserable!” At every stage in life, unhappiness is not a state to which we aspire. 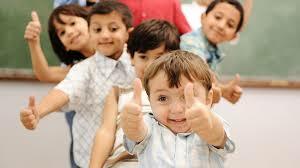 If you would like to learn the essentials to cultivate happiness in your life, read on! But within our current times of increasing instability, the pursuit of happiness can feel like a taunt rather than an inalienable right. Still, it’s worth the effort. Emerging research shows that while trauma has a profound impact on the brain, the brain is not as hard-wired as previously thought. In fact, the most popular class at Harvard University is one in which students learn to train their brains to cultivate what instructor Tal Ben-Shahar calls the ultimate currency: happiness. be more creative, confident and productive. have a stronger network of allies and friends. be sick less often and get well faster. Decide that you want to be happier. When you make that decision, you start to notice choices for happiness that you may have missed before. Those choices may be small, such as lying down for 10 minutes when you’re tired rather than powering through a task, but you start to create a habit of seeking happiness that grows. When you feel distressed, don’t make it worse by beating yourself up for being upset. Do your best to accept your feelings. When you give your feelings respect and attention, they usually begin to shift on their own, and you start to feel better. If you’re having thoughts that are hurtful to you, try reaching for a better thought or scenario that you can actually believe. For instance, if you’re worried about losing your job, recall something stable in your life, whether it’s your partner’s income or your healthy savings account. When your mind returns to the worry, bring it back to the better feeling thought. Whether it’s the achievement of a major goal or a week when your children got along, take in the accomplishment, and give yourself and your children a pat on the back. Happiness comes from doing something that gives us pleasure and meaning. If your job doesn’t provide that, find something that does. It could be a hobby, volunteering, taking a course, or allowing time to read a book or cook something tasty. Fulfillment can also come from living a life-on-purpose. Finding ways to express your purpose both at work and home will definitely increase your happiness quotient. Not sure of your Soul purpose or don’t know how to express it more fully in your life? Consulting your own Soul through the Akashic Records can give you answers to questions about what you actually came to the Earth to do and how to best express that purpose. Click through here for more information about the Akashic Records or to schedule a Reading in the Akashic Records for yourself. Let your Heart lead the way. The Heart Math Institute (HMI) has shown a direct negative influence on brain function when someone is experiencing anger, anxiety, fear, or frustration. Most of us have been taught in school that the heart is constantly responding to “orders” sent by the brain in the form of neural signals. However, it is not as commonly known that the heart actually sends more signals to the brain than the brain sends to the heart! Moreover, these heart signals have a significant effect on brain function—influencing emotional processing as well as higher cognitive faculties such as attention, perception, memory, and problem-solving. In other words, not only does the heart respond to the brain, but the brain continuously responds to the heart. During stress and negative emotions, when the heart rhythm pattern is erratic and disordered, the corresponding pattern of neural signals traveling from the heart to the brain inhibits higher cognitive functions. This limits our ability to think clearly, remember, learn, reason, and make effective decisions. The HMI calls the negative emotions, incoherent emotions, because of what they do to the heart rhythm. 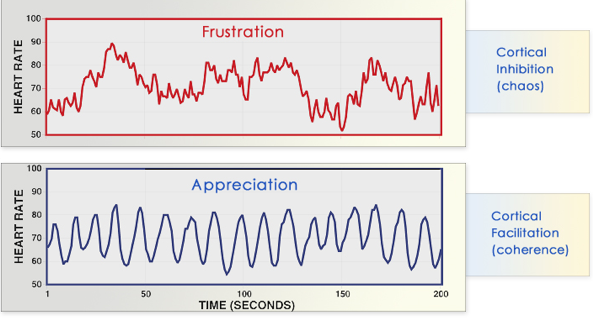 As you can see from the heart patterns above, feeling appreciation or gratitude can positively affect your heart rate and the signals that are sent to your brain. Spending time daily practicing the feeling of gratitude can not only improve your physical health, it can also make your smarter. We too often take the pleasures of our life for granted. Be grateful for everything that makes your day better, from a colleague’s smile to your morning latte. In order to focus on gratitude more, many people keep a daily Gratitude Journal where they write down 3 to 5 things they are grateful for each day. Setting a regular time of day (either first thing in the morning or right before you go to bed) to do this is helpful in creating the habit of gratitude. 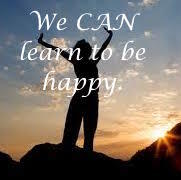 Please leave a comment below sharing one change you can make today to increase your Happiness Quotient. Are You a Blue Ray? Welcome to Heart of the Mother Healing’s Blog!